Shifting sands, barren landscapes, trekking through arid uncertainty. It’s a pretty good metaphor for wisdom. Oh, and spitting camels. Don’t forget the spitting camels. My wife is a few years younger than I am, and I think when I met her she was a bit impressed with me. She actually thought that I knew stuff, maybe I even had some wisdom. She quickly disabused herself of that opinion, of course. Familiarity, contempt, you know the routine. But it got me to thinking, What is wisdom? Or maybe I should try and stay within my abilities: What have I learned in my short decades on the planet? The first thing is, when you get older it’s not that you know what to do. You look like you know what to do, but that’s only because you don’t worry about it as much. You pick a reasonable path forward, get moving, and improvise as you go. The ER has helped me with that. Here I am in some small town, no surgical or other backup, I’m stuck with a sick patient, someone has to do something (and oh yes, I just had to become a doctor). So I keep doing as best I can. I have no other choice. Now, most people won’t get the experience of practicing emergency medicine. But to be honest, the best training I got for the emergency room wasn’t in medical school, it was waiting tables in Flower Mound, Texas. I learned a number of things there, the first of which is that the busier it gets, the more you slow down: focus, be clear about what is most important, and get it right the first time. And ignore everything else. I think of Sean Connery as Captain Marko Ramius in The Hunt for Red October. The Soviet submarine Red October is running an undersea canyon at break-neck speed, and there are incoming torpedoes. Everyone is screaming at Ramius, but he shuts his eyes, shuts them out, and focuses on counting out the seconds (and why doesn’t he just use a stopwatch, for Pete’s sake?) Suddenly he screams “Turn!” That’s what a lot of what handling crises looks like, and even handling much of the rest of life. It’s being clear about what’s really important, and trying hard to ignore everything else. Another thing I realized is that when you’re young you worry about what might happen. When you get older you realize it’s going to happen. But it’s not happening now, so try to chill and enjoy yourself. The last thing I learned, is less. For the first part of life, progress is about more: bigger, smarter, stronger, faster, wealthier, more skillful, more knowledgeable. At some point in life I realized, counter-intuitively, that progress starts to be about less. Your body declines, of course. Your mind, too. *sigh* But with experience, I find I know less. I can remember many more things, but still I’m not as smart or knowledgeable as I once was. But Life (or God, your choice) has this annoying persistence for sending us the same problem repeatedly, until we figure it out. 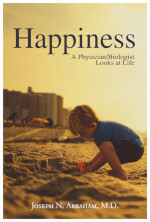 (For the definitive philosophical treatise on the subject, see the movie Groundhog Day.) More and more the repeated lesson appears to be, Don’t be so cocksure. The things I thought were important, the things I ‘knew’ to be true, I’m just not so sure of any more. The older I get the more I second guess myself and the more I doubt what I used to believe. Which is actually quite liberating. Once we doubt ourselves, we can then begin to doubt authority, and to be freer in our lives and perhaps, to be freed from some of our worries. This blog is an invitation for us all to keep an open mind about science, theology, government, education, and everyone and everything else. Now, I might boast that I am more open-minded than the most of you, because I am so much smarter. But alas, the preceding offers a more Ockhamian explanation: it’s probably just that I’ve screwed up more than many people have. So that is a way in which I am less than I was. I don’t know as much, because what I was sure I knew, I was wrong about. With that, I am beginning to define progress and success as having less and wanting less. It has been said, “Riches do not make one rich, but busy.”1)“Riches do not make one rich, but busy; they do not create a master, but a steward. Rather than possess riches, men are possessed by them. Wealth has brought death to many and stolen pleasure from all…” Fernando de Rojas, Celestina, Act 4 Scene 5, translated by Margaret Sayers Peden, Yale University Press, 2012. We are besieged with the material, with the status of owning something and appearing to be something. In the popularity mill, so much of what we are is what we have and what we wear, even how we wear our bodies. Our things define us. When I was younger (by a year or two, at least) I used to protect my things: old things, family things, rare things, beautiful things. Now I’m an old man with young kids, and I just can’t keep my kids out of my things. They play with them, abuse them, and break them. And my wife is outstanding at winnowing out all the things from the house, so that we can live more simply, with less clutter. It took some time and suffering, but I finally decided I like it better this way. The impermanence of my kids, of my family, of my home, and of today, that’s what’s important. The things, despite their apparent permanence, are simply things. They’re not important. I’ve been thinking about this watching the fight over the Confederate monuments in New Orleans. Some people want them gone, others want to preserve the history and traditions. I have to admit, I like old things, historical things, and being aware of their stories. I also think that publicly displaying historical objects is not the same as condoning what they stand for: I would not want Germany to bulldoze the concentration camps simply because they are offensive. But really, it doesn’t matter. In the final analysis they’re just things. Which brings me to the final wisdom I have thought about, and which combines two of the preceding. First, there is getting rid of ‘things’, or at least my attachment to them; and second, there is focusing on what’s important, and blocking out the rest. So I have learned to value the fleeting and ephemeral so much more than the solid and permanent. The other day a woman was sitting next to us with her 6 month-old daughter. I longingly realized I would give a great deal to once again be with my own daughter when she was that age. But she’s gone. I will never see that little girl again. My children teach me a lot, although I am a rather slow study. But by watching them, I try to learn to hold on to today, and realize that come tomorrow, today will be gone forever. And that’s more important than things, or at least any ‘thing’ that does not support us today and tomorrow. So, if I have any wisdom to share, that’s about it. But stick around. Next: How our children wanted less for Christmas. 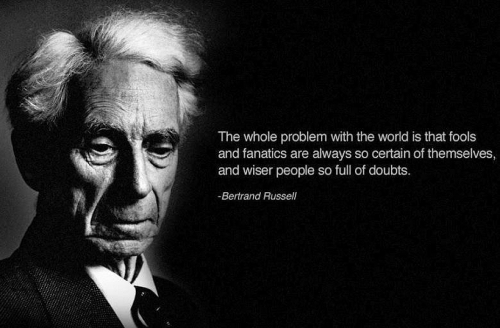 It’s a pity that Russell didn’t note that, sooner or later, we are all the fools & fanatics. Sahara picture courtesy of Wikimedia.org. Bertrand Russell quote courtesy of 1Olive.com. 1. ↑ “Riches do not make one rich, but busy; they do not create a master, but a steward. Rather than possess riches, men are possessed by them. Wealth has brought death to many and stolen pleasure from all…” Fernando de Rojas, Celestina, Act 4 Scene 5, translated by Margaret Sayers Peden, Yale University Press, 2012. The other day my granddaughter (13) dropped my laptop. (They actually use it more than I do. Netflix and YouTube videos entertain them more than I want to admit. ) It was hung up in some in-between word on Friends. I couldn’t turn it off. I told her to just put it on the table and maybe her dad could fix it. Ok. I cursed first. A couple of hours later both girls came running in to tell me that they had fixed it. In the meantime, while they were very quiet, they had mentally pooled all their cash, savings, and had sold anticipated Christmas presents and had traded in various devices. They said they had come up with about $700. I was/am so ashamed and a little tickled. Yes it is just a thing and probably more precious to them than me. One more little step in the maturing process where we want them to grow to consider others more than themselves. The sad thing I find is that holding on to the moment and practicing gratitude does not make it easier to watch them grow up. It makes it so much harder. Your granddaughters sound like jewels. And children can embarrass us so much with their generosity, of spirit and of possessions.